This vegetarian, vegan, and gluten-free crock pot vegetable chili recipe doesn't skimp on the veggies or the flavor. It's made with onion, garlic, chili powder, and cumin for flavor, plenty of beans, and it's filled up with healthy vegetables. Running low on some of those veggies? Feel free to omit one or two of the vegetables and add a few more of another kind to make it up—you'll still end up with a fantastically healthy and delicious vegan vegetable chili. The great thing about using your slow cooker to make chili (or just about anything) is how easy it is. Just chop your veggies up, dump them in, and you're good to go! Just place all the ingredients in your crock pot or slow cooker, and come home to a healthy and complete vegetarian meal with a good amount of your five-a-day servings of vegetables (and not a lot of fat and calories, as this chili is very low in both)! Make a double-batch and get creative with your leftover chili! Need a weekday lunch idea? You may want to freeze leftover chili in individually portioned containers to bring with you into the office for a healthy home-cooked (and cheap) lunch on weekdays. Combine all the ingredients in a crock pot or slow cooker and give them a quick stir. Cover and cook on your crock pot's low setting for about 6 to 8 hours. Taste, and then adjust the seasonings to taste. You may want to add a bit of salt and pepper, depending on your personal preference and taste buds. Use sea salt or kosher salt and freshly ground black pepper for the best taste. 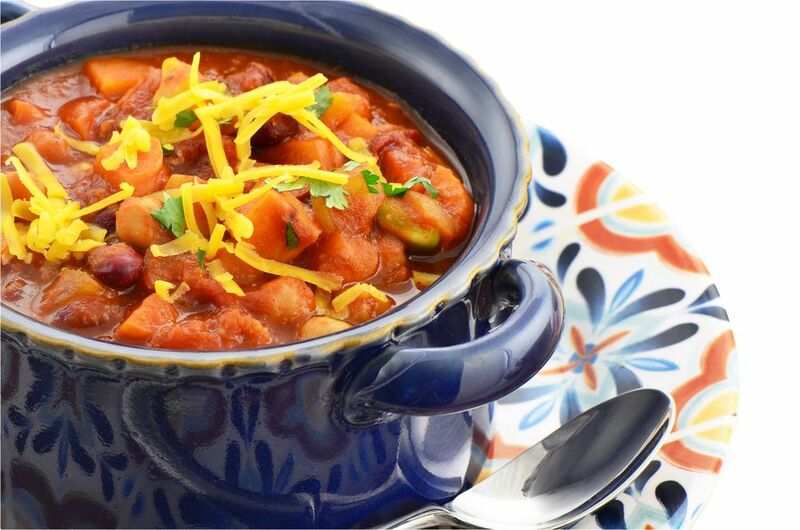 This crock pot vegetable chili recipe makes about 5-6 servings as a main dish. You can always serve topped with a bit of cheese or your favorite non-dairy vegan cheese substitute. Many vegans like to top vegetarian chili off with nutritional yeast.